The first new Avenger novel in 40 years! The crime fighter with the moldable face…the avatar of vengeance…the combination of the Shadow and Doc Savage …is back! His name is Sun Koh. He claims to be the last survivor of Atlantis, and he may be the most dangerous man alive. 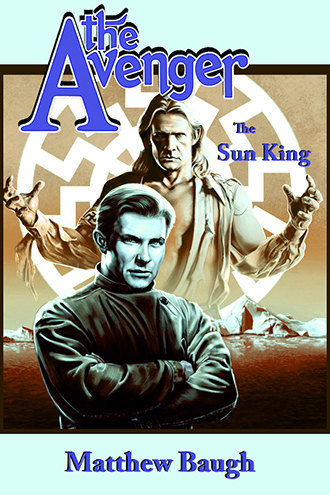 A physical and mental superman with the resources of Nazi Germany at his fingertips, Sun Koh plans to recover an ancient power that could doom millions, and win the war for the Third Reich. Only Richard Benson and the members of Justice, Inc. oppose him, but this time, even the Avenger may have met his match. This novel is a continuation of the original pulp novel “River of Ice”.